Traveller’s Tales LEGO series often makes me croon to be young again. I say this with the upmost of respect: LEGO Racers, Island, Rock Raiders and Star Wars absolutely defined my childhood. What made them so successful? They simply had one thing in common (well two, discounting the fact they’re all LEGO based)… their individuality was second to none. Racers challenged the enormously popular Mario Kart series at a time when no other franchise dared, Island introduced sandbox gameplay to kids years ahead of the curb – by the time Star Wars hit our shelves it was safe to say LEGO videogames were truly dominating the market for that particular age-range. 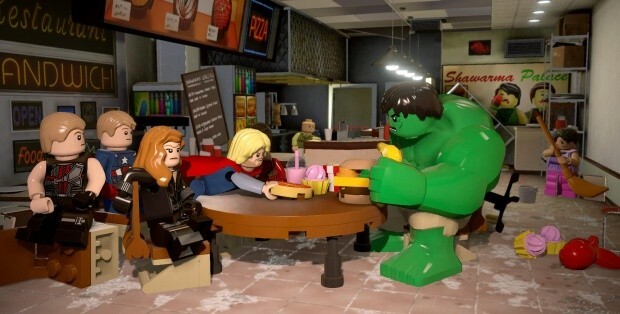 Almost two decades later we arrive at Traveller’s Tales first 2016 release – LEGO Marvel’s Avengers. All that’s left to discuss now is, just how does it fare to those beauties from the past? 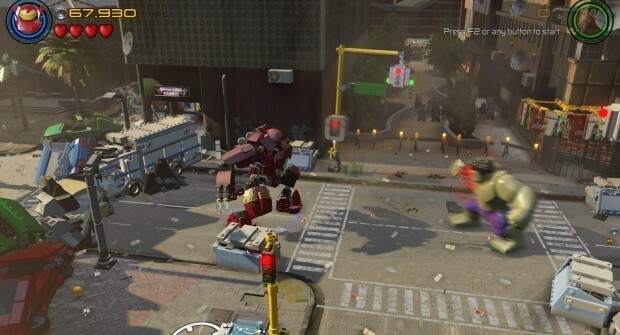 LEGO Marvel’s Avengers throws one/two players headfirst into the intoxicating world of Marvel for the second time round this gaming generation. With sound bites extracted from the Hollywood films and plot strands closely following those of The Avengers, The Avengers: Age of Ultron, Iron Man 3, Thor: The Dark World and Captain America: The Winter Soldier – Marvel’s Avengers definitely has presentation nailed. Hearing the somewhat foreboding Avengers theme blast onto the start menu may not be as joyful to hear as Jurassic Park’s was last time out – but it adds much needed production value and authenticity to this title. The first contentious point to put to bed is that yes indeed, LEGO Marvel’s Avengers is exactly the same formula as the past several TT releases. This isn’t, as some critics are trying to enforce, to the games’ detriment at all – rather it just cements the notion that the LEGO formula is a winning one. We rarely criticise the FIFA or Call of Duty franchise for their perceived repetitiveness, it shouldn’t be a factor when discussing what is essentially a children’s game. The game delivers several hours of engaging offline-multiplayer content, from the always-perplexing puzzles to the much-improved combat. Broken up by swift, slapstick interpretations of key scenes from each movie – the game consists of moving from set-piece to set-piece smashing up redundant LEGO items and building them into useful tools to help you progress. If that doesn’t sound demanding enough, gamers must also achieve this whilst fending off hoards of cannon-fodder foes. This, for me, is where the game really comes into its own. I’ve never known LEGO combat to feel as refined as it does with Marvel’s Avengers. Each character (of which there are an abundance, ranging from the Avenger’s themselves to lesser known heroes from the comics and movies) has their own set of abilities that feel unique and significant when used at the right time. Most attacks follow a fairly similar recipe – you have a long-range attack (Hawkeye’s firing arrows or Iron Man’s energy beams, for example), a close-up attack (smashing someone over the head with Hawkeye’s bow… for example) and a few special attacks that usually see your character recreating a knockout move from the film – queue Hulk’s hilarious ground-pounding of Loki from the original flick. Team takedowns also make an appearance here, emphasizing the tremendous importance of playing with a friend. Using your ally to complete a puzzle or perform an amazing put-down has never felt so good and with a ridiculous amount of combos to choose from the game has seemingly endless replay value. The game is not without flaws, some of which I encountered in the opening few minutes. When trying to expand its gameplay to something a little less repetitive, the game occasionally tries its hand at some impressive set pieces. The first has you flying around as Iron Man, recreating the arcade-like quality of an on-the-rail shooter – while your teammate Captain America completes puzzles on ground level. Issue is, attempting to switch between the two can lead to disastrous consequences – please see my image here of Captain America, spawned and stuck behind an unbreakable object. I tried for a good ten minutes to see if I could commit brickacide (that’s LEGO suicide to you and me) or could get my opponents to shoot me – but alas my miniature accidental fortress proved too strong. Therefore I had to restart the game, an issue I’ve never had before in a LEGO title. Bugs are a modern frustration, yet they rarely factor in my decision-making process of whether or not a game is a good one (I use the hugely successful yet horrendously bug-tacular Fallout 4 as an example here). My key factors are the following: does it play well? Is it well presented? Does it achieve the job its set out to do? 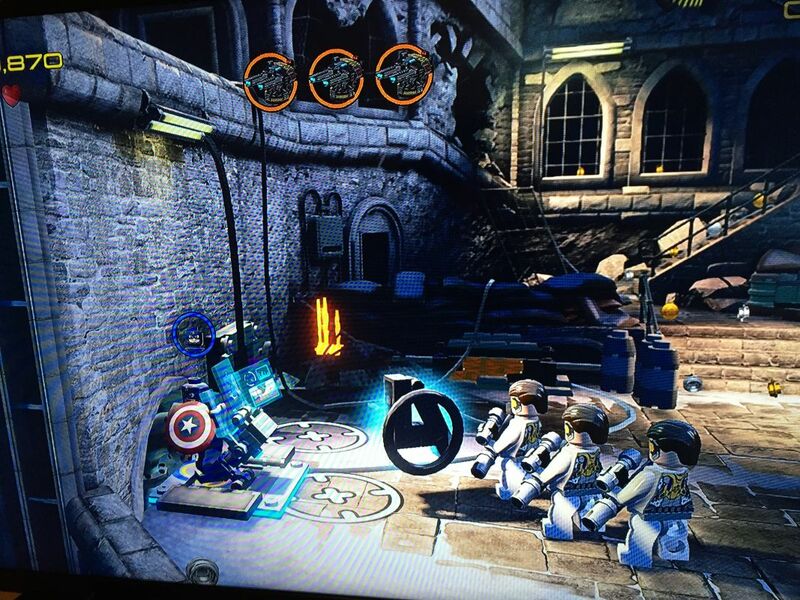 On all counts here I find LEGO Marvel’s Avengers a resounding success. I hark back to my opening sentiment ‘Traveller’s Tales LEGO” series often makes me croon to be young again’ – purely so I could enjoy fantastic gaming like this on a regular basis, only difference being it would affect me more on an emotional level than it currently does as an adult. Having an ensemble class of Hollywood voice talent (albeit borrowed from the films) at your disposal never dents your chances of producing a top game; from the child-friendly puzzle-solving gameplay to the iconic animation and the swooping Avengers soundtrack, I was totally won over by 2016’s LEGO offering. Bring a new meaning to Avengers Assemble! Overall, LEGO Marvel’s Avengers is another stellar offering from the guys at Traveller’s Tales. The frequency of their output may (quite rightly) alarm some consumers, but a game should always be judged on its quality and here the quality of the output is concrete. Pair that with some charming presentation absolutely brimming with production value and it’s easy to see why this winning franchise keeps going from strength to strength.